Pictured front row/left-right: Haley Adcock, Sherry Adcock, Cathy Fincher, Jenny Clary, Gloria Pritchard-Gittings, Carole Harrison. Pictured back row/left-right: John Cope, Matt Rice, Stacey Sanders, Philip Minor, Jeff Clary, Forrest Carden, Rick Coffin, Bill Hassell. Weichert Realtors Porter Properties, located in Auburn, is proud to announce their 2015 Office Award Winners. REALTOR Jeff Clary earned the highest award at WEICHERT, REALTORS® - Porter Properties, bringing home the prestigious Chairman’s Club award as well as the award for being the top selling associate and top overall performing associate in the Alabama/Tennessee region. In addition, 11 other Weichert® affiliated agents were honored by the national franchise organization, Weichert Real Estate Affiliates, Inc. The awards were presented by Weichert Real Estate Affiliates, Inc. Chief Operating Officer Bill Scavone and Regional Directors Amber Hassell and Bill Hassell at an awards banquet on March 5 at the Read House Historic Inn & Suites in Chattanooga, Tennessee. Awards are based on a minimum requirement per award category in gross commission income earned or real estate transactions closed in 2015. Jeff Clary (Chairman’s Club Award), Cathy Fincher (President's Club Award), Rick Coffin (President's Club Award), Blake Cleveland (Ambassador Club Award), Sherry Adcock (Ambassador Club Award), Gloria Pritchard-Gittings (Executive Club Award), Jeff Simpson (Executive Club Award), Jenny Clary (Executive Club Award), John Cope (Executive Club Award), Carole Harrison (Sales Achievement Award), Danny Gould (Sales Achievement Award) and Haley Adcock (Sales Achievement Award). 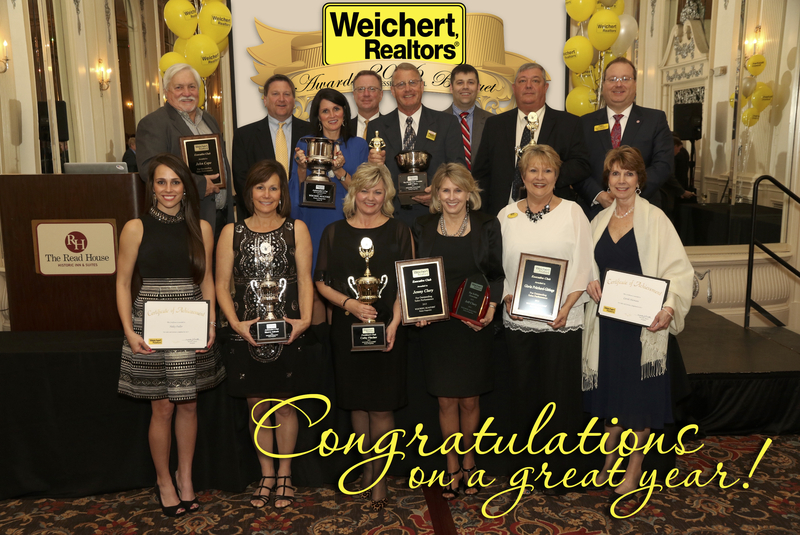 The 2015 Award Winners are part of a team of knowledgeable and dedicated agents at Weichert Realtors Porter Properties who bring many years of combined real estate experience to their clients. Weichert Realtors Porter Properties is an independently owned and operated Weichert® affiliated office serving Auburn, Opelika and Lee County. In addition to the 12 Weichert affiliated agents honors the Weichert Realtors Porter Properties office was also recognized by the national franchise network with the Ambassador’s Cup Office Award.